Located in the Endless Mountains of Northern Wayne County, Pennsylvania, is our 4th generation family farm. We farm because we love it. Working the land responsibly, building quality genetics, lots of TLC for our herd, and providing a healthy, quality product is our family tradition. Our family is proud to offer choice, grass-fed beef that has no hormones, no antibiotics, and no GMOs. Every farm has its own way of doing things. With that said, there are as many techniques to farming as there are families. Our family farm has seen its own program change through the generations. There was scuttle when grandpa decided to purchase the first tractor and retire our draft horses, more debates when dad and mom decided to build a silo for haylege. Moving solely to grass-fed beef was the latest generations' contribution to King Hill. The summer months are always busy with the haying season. However, the grandchildren get teased a bit by the rest of the family about spending much of their days "playing" with the cows. Honestly, it is the most relaxing, fun part of the day! They watch them, pet them, and walk along chatting with each other as the cattle graze. Our grandson calls it "becoming part of the herd". We have had many breeds of cattle on King Hill over the last century, but we all quickly fell in love with the White Park breed. 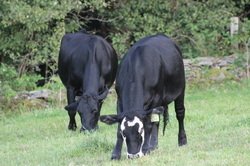 Not only are they cute, they are also docile, and when it comes to eating grass...well, they are meat making machines! There are so many options when it comes to having beef for your meal. Whether you consider yourself a burger kid-at-heart, a BBQ brisket girl, or nicely grilled steak type of guy, beef offers many cuts and recipes for you to fall in love with.